(CNN) — President Barack Obama is the first American leader in decades to visit Malaysia, the Asian nation grappling with the mystery of a vanished jetliner. 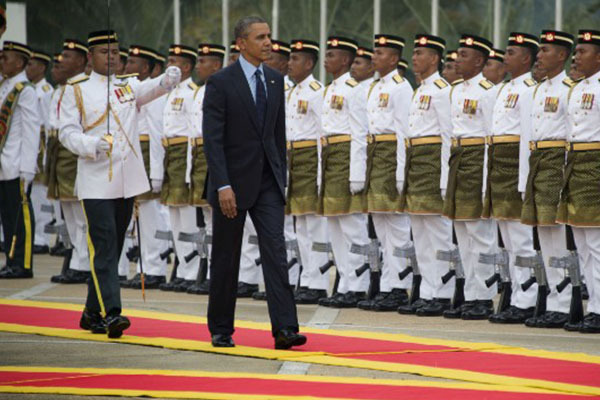 Obama landed in Kuala Lumpur on Saturday, seven weeks to the day Malaysia Airlines Flight 370 disappeared with 239 people aboard. He’s remained largely quiet over the issue amid an international underwater search focusing on the southern Indian Ocean. A day before his arrival, he told a Malaysian newspaper, The Star, that the U.S. remains committed to the search. “The United States was one of the first countries to join in the search for the missing plane,” he said. Obama will discuss the search for the missing plane with Malaysia’s Prime Minister, Deputy National Security Adviser Ben Rhodes told reporters, but it will not be the only item on the agenda. Malaysia is a growing partner of the United States, which seeks to deepen that relationship, Rhodes said. Previously, another device, a “towed pinger locator” detected signals that officials believed were from its flight recorders, which determined the current search area for the Bluefin. The underwater sonar device plunged into the Indian Ocean on Saturday, kicking off its 14th mission. It has slowly scoured 95% of the ocean floor that searchers had narrowed down for it. So far, it has found no trace of the missing jetliner. If the Bluefin-21 searches 100% of the area with nothing to show for it, the underwater search may expand Australian officials said. The underwater search so far has focused on a circle with a 10-kilometer (6.2-mile) radius around the location of a detected “ping,” the Joint Agency Coordination Center said. The plane disappeared after leaving Kuala Lumpur, Malaysia, for Beijing. It’s the same recommendation that was made after the Air France Flight 447 went down in the Atlantic Ocean in 2009. “Anytime there is a tragedy like this we ought to also reflect on what can be done going forward to prevent something similar from happening again,” Obama said.